Richard Powell OBE, Chair of Wild Anglia, was delighted to be invited to return for the second year and to this time host the Norwich and Norfolk Eco Awards 2017-18 ceremony, held at The Halls in Norwich. 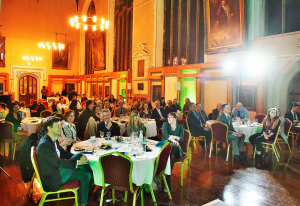 The awards, hosted jointly by Norwich City Council and Norfolk County Council, celebrate projects and schemes with a strong ecological or environmentally-friendly ethos, or groups and organisations which can show they adopt a sound eco approach to their business. Applications were open to local schools, businesses, community groups, food producers, and to celebrate the tenth anniversary of awards, there was the new category of Eco Hero which was put to a public vote. The projects were very strong with some fantastic innovative ideas, ranging from outside classrooms to new ways in helping people in food poverty. We were delighted to introduce each project to the audience, meet the local unsung environmental heroes and hand over the trophies for the sponsors to present. For a summary of the winners and winning projects, and for news on the 2019 awards, please visit the awards page here. We look forward to seeing more outstanding local environmental work across Norfolk (and Suffolk!) this year.